Review of football players, news related for them (age, clubs where they play/ed, history, wags...). This blog is part of enko-football.com site. Kevin De Bruyne (born 28 June 1991) is a Belgian footballer who plays as an attacking midfielder for Chelsea. 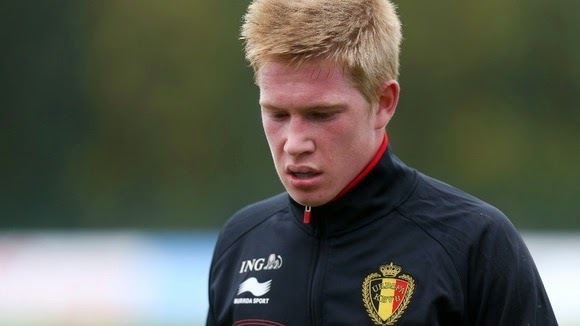 Born in Drongen, De Bruyne began his career with hometown club KVV Drongen in 1999. Two years later, he joined Gent and on 2005 moved to Genk. De Bruyne continued his development in their youth set-up and was rewarded for his progress by being promoted to the first team squad in 2008. He made his first team debut for Genk in a 3–0 defeat at Charleroi on 9 May 2009. Having established himself in the team the following season. On 7 February 2010, De Bruyne scored his first goal for the club, which secured all three points for Genk in a 1–0 win against Standard Liège. He scored five goals and made 16 assists in 32 league matches during the 2010–11 season as Genk were crowned Belgian champions for the third time. On 29 October 2011, De Bruyne scored his first hat-trick for Genk against Club Brugge which ended in a 5–4 win for Genk. On 28 January 2012, de Bruyne scored a brace against OH Leuven in a 5–0 win. On 18 February 2012, De Bruyne scored his first goal back at KRC Genk following his agreed transfer to Chelsea and also assisted the other goal in a 1–2 away win for Genk against Mons. De Bruyne ended the season by wrapping up the scoring in a 3–1 victory over Gent, he finished the league campaign with eight goals from 28 appearances. On 31 January 2012, transfer deadline day, Chelsea and KRC Genk announced the permanent signing of De Bruyne, with the fee rumoured to be in the region of £7 million. He signed a five-and-a-half-year contract at Stamford Bridge, but would stay at Genk for the remainder of the 2011–12 season. On 2 August 2012, Chelsea announced that De Bruyne was to join Werder Bremen in the German Bundesliga on a season-long loan deal after having successfully completed a medical. On 18 January 2014, Wolfsburg signed De Bruyne for a fee of £18 million, ending a protracted transfer saga.